Wind is a gently force, but can sometimes be furious, destroying everything in it’s path. Palgwe Oh Jang should be performed like the wind: gently, but knowing the ability of mass destruction with a single movement. 35 Movements, 2 kicks, 9 punches, 2 keup. Ready stance (Joonbi). Move the left foot to the rear assuming a right forward stance (Ap Kubi). Execute a right scissor block (Kawi Makki). Move the left foot turning 90° assuming a right back stance (Dwit Kubi). Execute a left double knife hand down block (Sonnal Arae Makki). Advance assuming a left back stance (Dwit Kubi). Execute a right double knife hand middle block (Sonnal Momtong Makki). Retreat assuming a right back stance (Dwit Kubi). Execute a left middle pressing palm block (Batangson Momtong Nollo Makki). Advance to a right forward stance (Ap Kubi). Execute a right middle punch (Momtong Jireugi). Moving right foot, turn clockwise 180° into a left back stance (Dwit kubi). Execute a right double knife hand down block (Sonnal Arae Makki). Advance to a right back stance (Dwit kubi). Execute a left double knife hand middle block (Sonnal Momtong Makki). Retreat to a left back stance (Dwit kubi). Execute a right middle pressing palm block (Batangson Momtong Noolo Makki). Advance to a left forward stance (Ap Kubi). Execute a left middle punch (Momtong Jireugi). Moving left foot, turn counterclockwise 90° into a left forward stance (Ap Kubi). Execute a left scissor block (Kawi Makki). Advance to a right forward stance (Ap Kubi). Execute a right augmented middle block (Kodureo Momtong Makki). Advance to a left forward stance (Ap Kubi). Execute a left augmented middle block (Kodureo Momtong Makki). Advance to a right forward stance (Ap Kubi). Execute a left palm pressing middle block and a right spear hand strike (Pyeon Sonkkeut Sewo Chireugi). Yell (Kihap). Moving left foot, turn counterclockwise 270° into a left forward stance (Ap Kubi). Execute a left outward middle block (Momtong Bakkat Makki). 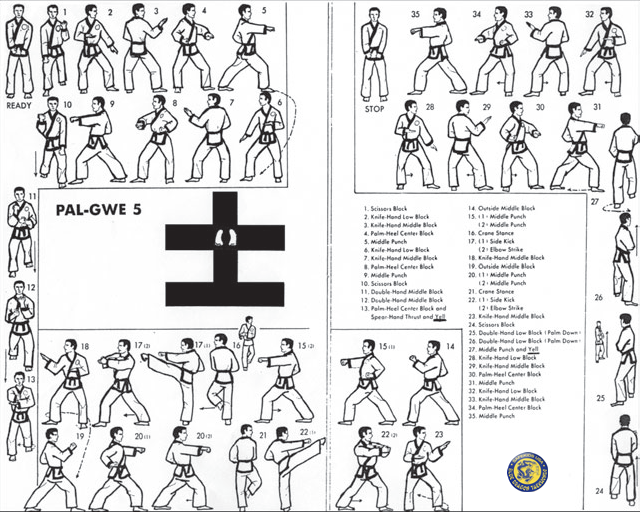 Maintaining the same stance, execute a double middle punch, right fist first (Dubeon Momtong Jireugi). Keep the right foot fixed; raise the left foot to assume a right crane stance (Hakdari Seogi). Bring the right fist (palm up) to the right side. The left fist is held palm toward the middle over the right one. Simultaneously execute a left side kick (Yop Chagi) and a left punch (Jireugi). Assume a left forward stance (Ap Kubi). Execute a right elbow middle strike (Palkoop Pyojeok Chigi). Step forward into a left back stance (Dwit Kubi). Execute a right double knife hand middle block (Sonnal Momtong Makki). Pivot on the ball of the left foot, turn clockwise 180° into a right front stance (Ap Kubi). Execute a right outward middle block (Momtong Bakkat Makki). Maintain the same stance. Execute a double middle punch, left fist first (Dubeon Jireugi). Keep the left foot fixed. Raise the right foot to assume a left crane stance (Hakdari Seogi). Bring fists to the left hip. Simultaneously execute a right side kick (Yop Chagi) and a right punch (Jireugi). Assume a right forward stance (Ap Kubi). Execute a left elbow middle strike (Palkoop Pyojeok Chigi). Moving the left foot, turn counterclockwise 90° into a left forward stance (Ap Kubi). Execute a left scissor block (Kawi Makki). Advance to a left back stance (Dwit Kubi). Execute a right augmented double down block (Kodeureo Arae Makki). Advance to a right back stance (Dwit Kubi). Execute a left augmented double down block (Kodeureo Arae Makki). Advance to a right forward stance (Ap Kubi). Execute a right middle punch (Momtong Jireugi). Yell (Kihap). Moving left foot, turn counterclockwise 270° into a right back stance (Dwit Kubi). Execute a left double knife hand down block (Sonnal Arae Makki). Advance to a left back stance (Dwit Kubi). Execute a right double knife hand middle block (Sonnal Momtong Makki). Retreat to a right back stance (Dwit Kubi). Execute a left pressing block (Batangson Nollo Makki). Moving right foot, turn 180° into a left back stance (Dwit Kubi). Execute a right double knife hand down block (Sonnal Arae Makki). Retreat to a left back stance (Dwit Kubi). Execute a right pressing palm block (Batangson Momtong Nollo Makki). Advance to a left forward stance (AP Kubi). Execute a left middle punch (Momtong Jireugi). Ready stance (Geuman) Pivot on right foot, turn body to the left.